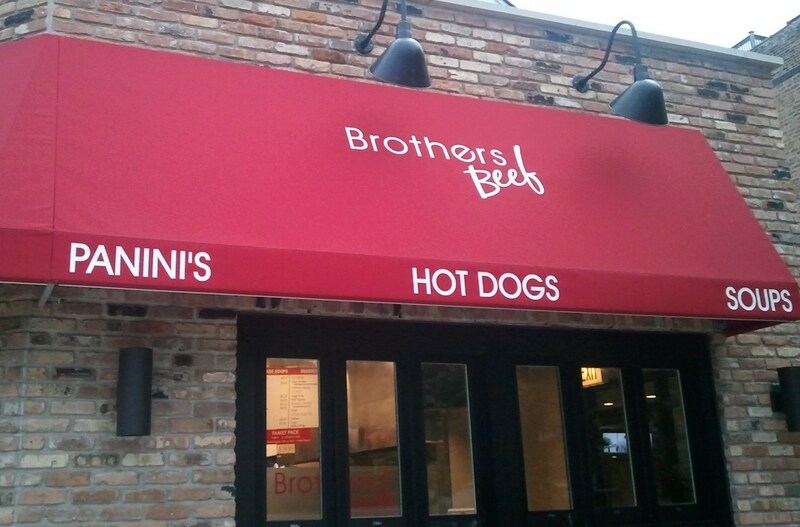 On Armitage I had seen a place that I hoped was serving Italian Beef, I think that it was the name “Brother’s Beef” that originally clued me in. For my expat friends back in the UK I should explain a little more, it is a sandwich in a roll filled with thin slices of seasoned roast beef, and soaked in the cooked meat juices. The Sandwich originated in Chicago back in the 1930s. It is almost like a sunday roast beef sandwich in gravy, except that the meat is cut much thinner, tends to be well done and the gravy is much thinner. The sauce tends to be much more peppery and you can get it with sweet or spicy peppers. To be honest even though I now live in Chicago I prefer the Philly Cheesesteak as the better option of this type of sandwich although I expect such comments will see the sandwich police banging on the door trying to persuade me that they are so different, but lets face it, both are thinly sliced beef in a roll. 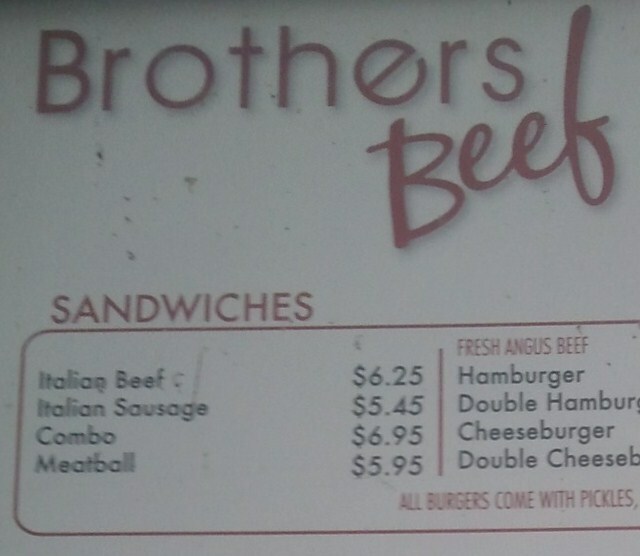 There were plenty of options on the menu including burgers, hot dogs and panini’s, but as this place is called Brother’s Beef, and that I came here for beef, one felt that one had to try some beef. Give me beef! 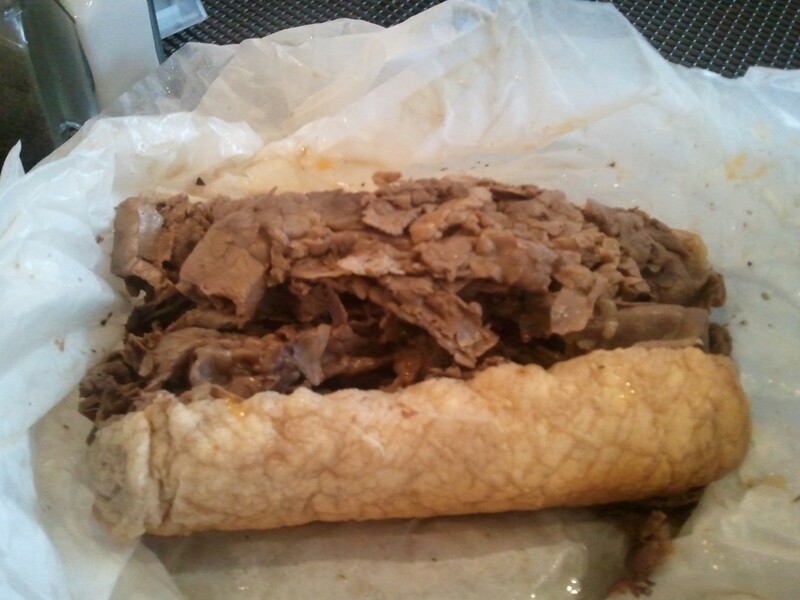 This Italian Beef was taken dipped, not double dipped, but for those of you who think maybe I am dipping into sprinkles, no. Dipped is dipped into the cooking juice, light gravy so that the bun becomes juicy or is it soggy? Either way when selecting the dipped option you need to take into consideration the colour of your shirt, as there may be some juice spillage. It was a good sandwich, way too big, and the meat was a bit dry despite being dipped, but heck I am no expert, I am still amazed that even when dipped the bread does not fall apart. I guess that there must be some sort of scientific laboratory in the world working on bread dynamics that develops these things. located at 723 W Armitage Avenue about 10 minutes walk from the Armitage El stop towards the lake.